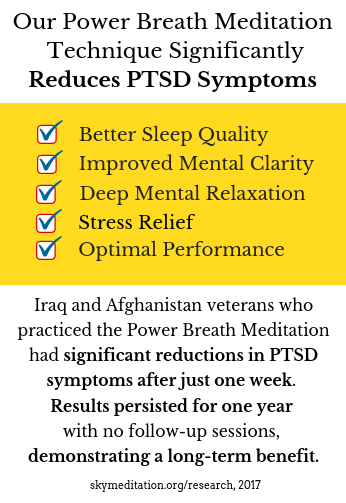 Research shows that veterans experience tremendous relief from symptoms of post-traumatic stress (PTS) using our scientifically backed breath-based meditation techniques. These powerful techniques provide relief from the extreme stress of military life including multiple deployments, traumatic events, and reintegration with family and community. Despite advances in traditional therapy and drug-based treatments, a recent study shows that only 50% of patients who complete such treatments recover (Ballenger et al., 2000)! There is a critical need for alternative approaches to the anxiety, trauma, rage, sleeplessness, and other side-effects of war. More and more VA hospitals and community veteran centers are turning to mind-body practices such as breathing, yoga, and meditation. Preliminary research results are promising and many veterans claim that these practices have been extremely helpful. The Power Breath Meditation Workshop is a mind-body resilience-building program for returning veterans. A cornerstone of the Power Breath Meditation Workshop is the SKY (Sudarshan Kriya Yoga) Practice, a set of breathing techniques. SKY has been shown to reduce anxiety, depression, and stress, and to increase self-reported optimism and well-being (Brown and Gerbarg, 2005; Kjellgren, Bood, Axelsson, Norlander, & Saatcioglu, 2007; Janakiramaiah, 2000). One study suggested that SKY may be effective for PTSD in particular. Patients with PTSD stemming from the 2004 Tsunami benefited equally from SKY alone as from a combination of SKY and exposure therapy when compared with a wait-list control (Descilo et al., 2009). SKY has even been shown to positively impact rapid gene expression alterations (Qu et al., 2013). Controlled respiration exercises are aimed at reducing anxiety and arousal by bringing the body to a physiologically relaxed state (Feuerstein & Miller, 1998). Emotion regulation research shows that respiration and emotion are tightly linked psychological processes (Boiten et al. 1994) and that emotions produce particular rhythms of breath which, when replicated, can induce that emotion (Phillippot, 2002). Research suggests that controlled respiration exercises bring immediate, experienced effects among psychiatric patients (Brown & Gerbarg, 2009). Controlled breathing interventions have resulted in decreased depression (Murthy et al., 1998; Pilkington et al., 2005) and anxiety (Clark and Hirschman 1990). Controlled respiration exercises also appear to reduce pain thresholds (Zautra et al., 2010) and to alleviate withdrawal symptoms in smokers (McClernon et al., 2004). Studies suggest that the effects of controlled respiration techniques on stress and anxiety may be due to respiration’s effects on physiological indicators of autonomic balance including increased tone in the vagus nerve (Raghuraj et al., 1998; Raghuraj & Telles, 2008). Controlled breathing exercises have also been shown to reduce pain thresholds (Zautra et al., 2010) and withdrawal symptoms in nicotine dependence (McClernon et al., 2004). Sudarshan Kriya is a controlled respiration technique taught in the workshops offered by the Art of Living Foundation and the International Association for Human Values. Its effects have been studied in open and randomized trials, both in healthy populations and in populations with psychopathology. Research suggests that Sudarshan Kriya may reduce depression, anxiety, and stress and that it increases well-being, optimism, and mental focus (Bhatia et al., 2003; Doria et al., 2015; Janakiramaiah et al., 2000; Kjellgren et al., 2007; Kochupillai et al., 2005; Murthy et al., 1998; Vedamurthachar et al., 2006, Brown & Gerbarg 205; Seppala et al. 2014) and that it can help improve emotion regulation (Gootjes et al., 2011). These effects may be mediated by benefits to the immune system (Kochupillai et al., 2005), improvements in the antioxidant defense mechanisms (Sharma et al., 2003; Sharma et al., 2008), and rapid gene expression alterations (Qu et al., 2013). 2. In a randomized controlled study of patients with Major Depressive Disorder, University of Pennsylvania psychologists found that SKY significantly improved depression and anxiety after 8 weeks (a 1-week intervention followed by a weekly group practice and daily home practice for 7 weeks). 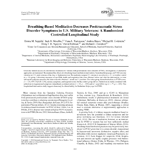 Breathing exercises may be counter-indicated for certain health conditions. In these cases, our instructors are trained in teaching alternate and adapted versions of the exercises. It is always advised to check with your health provider when engaging in any new change to your health regimen. A Harvard University health publication describes research on the Sudarshan Kriya’s effects on anxiety, stress, depression, and overall health. Research by Stanford scholar Emma Seppala at the Center for Compassion and Altruism Research and Education found that post-traumatic stress disorder decreased in veterans who participated in a weeklong breathing, yoga and meditation workshop, and remained lower a year later. Department of Tumor Biology, Institute for Cancer Research, Oslo University Hospital, Oslo, Norway, Genomics Core Facility, Department of Biosciences, University of Oslo, Oslo, Norway. A Breathing-Based Meditation Intervention for Patients With Major Depressive Disorder Following Inadequate Response to Antidepressants: A Randomized Pilot Study. Anup Sharma, MD, PhD; Marna S. Barrett, PhD; Andrew J. Cucchiara, PhD; Nalaka S. Gooneratne, MD; and Michael E. Thase, MD. Journal of Clinical Psychiatry 2017; 78 (1):e 59– e63. 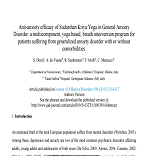 Disorder: a multicomponent, yoga based, breath intervention program for patients suffering from generalized anxiety disorder with or without comorbidities. 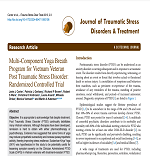 Multi-Component Yoga Breath Program for Vietnam Veteran Post Traumatic Stress Disorder: Randomized Controlled Trial. Ballenger J.C., Davidson J.R., Lecrubier Y., Nutt D.J., Foa E.B., Kessler R.C., . . . Shalev A.Y. (2000) Consensus statement on posttraumatic stress disorder from the International Consensus Group on Depression and Anxiety. Journal of Clinical psychiatry, 61 Supplement, 5:60-6. Bhatia, M., Kumar, A., Kumar, N., Pandey, R.M., and Kochupillai, V.(2003). Electrophysiologic evaluation of Sudarshan Kriya: an EEG, BAER, and P300 study. Indian J. Physiol. Pharmacol, 47, 157-163. Boiten, F.A., Frijda N.H., Wientjes, C.J. (1994). Emotions and respiratory patterns: review and critical analysis. International Journal of Psychophysiology, 17, 103-128. Brown, R.P., Gerbarg, P.L. (2009). Yoga breathing, meditation, and longevity. Annual New York Academy of Sciences, 1172, 54-62. Clark, M.E., Hirschman, R. (1990). Effects of paced respiration on anxiety reduction in a clinical population. Biofeedback and Self Regulation, 15, 273-284. Descilo, T., Vedamurtachar. A., Gerbarg, P. L., Nagaraja, D., Gangadhar, B. N., Damodaran, B., Adelson, B., Braslow, L. H., Marcus, S., Brown, R. P. (2009). Effects of a yoga breath intervention alone and in combination with an exposure therapy for post-traumatic stress disorder and depression in survivors of the 2004 South-East Asia tsunami. Acta Psychiatr Scand 2009: 1–12. Feuerstein G, Miller J (1998) The essence of yoga : essays on the development of yogic philosophy from the Vedas to modern times, 1st Inner Traditions Edition. Rochester, Vt.: Inner Traditions. Gootjes, L., Franken, I.H.A. & Strien, J.W. van (2011). Cognitive Emotion Regulation in Yogic Meditative Practitioners: Sustained Modulation of Electrical Brain Potentials. Journal of Psychophysiology, 25(2), 87-94. Janakiramaiah N, Gangadhar BN, Naga Venkatesha Murthy PJ, Harish MG, Subbakrishna DK, Vedamurthachar A (2000) Antidepressant efficacy of Sudarshan Kriya Yoga (SKY) in melancholia: a randomized comparison with electroconvulsive therapy (ECT) and imipramine. J Affect Disord 57:255-259. Kochupillai V, Kumar P, Singh D, Aggarwal D, Bhardwaj N, Bhutani M, Das SN (2005) Effect of rhythmic breathing (Sudarshan Kriya and Pranayam) on immune functions and tobacco addiction. Ann N Y Acad Sci 1056:242-252. Murthy, P.J., Janakiramaiah, N., Gangadhar, B.N., Subbakrishna, D.K. (1998) P300 amplitude and antidepressant response to Sudarshan Kriya Yoga (SKY). Journal of Affective Disorders, 50, 45-48. Philippot, P., Chapelle, G. T., Blairy, S. (2002) Respiratory feedback in the generation of emotion. Cognition & Emotion, 16, 605 – 627. Pilkington, K., Kirkwood, G., Rampes, H., Richardson, J. (2005) Yoga for depression: the research evidence. Journal of Affective Disorders, 89, 13-24. Raghuraj, P., Telles, S. (2008) Immediate effect of specific nostril manipulating yoga breathing practices on autonomic and respiratory variables. Applied Psychophysiology and Biofeedback, 33, 65-75. Raghuraj, P., Ramakrishnan, A.G., Nagendra, H.R., Telles, S. (1998) Effect of two selected yogic breathing techniques of heart rate variability. Indian Journal of Physiology and Pharmacology, 42, 467-472. Sharon Sagemann. How SK Can Treat the Cognitive, Psychodynamic and Neuro-Psychiatric Problems of Post Traumatic Stress Disorder. Sageman, S., and Brown, R. 2006. Free at Last, in DSM-IV-TR Case Book Volume 2, edited by R.L. Spitzer, M.B. First, J.B.W. Williams, M. Gibbon. American Psychiatric Publishing, Inc. Washington, DC. 2006. pp.109-121. Sharma, H., Sen, S., Singh, Bhardwaj, N.K., V. Kochupillai, N., Singh (2003). Sudarshan Kriya practitioners exhibit better antioxidant status and lower blood lactate levels. Biological Psychology, 63:281-291. 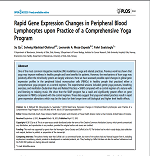 Sharma, H., Datta, P., Singh, A., Sen, S., Bhardwaj, N.K., Kochupillai, V. , N. Singh, N. (2008) Gene expression profiling in practitioners of Sudarshan Kriya. Journal of Psychosomatic Research 64 , 213–218. Vedamurthachar A, Janakiramaiah N, Hegde JM, Shetty TK, Subbakrishna DK, Sureshbabu SV, Gangadhar BN (2006) Antidepressant efficacy and hormonal effects of Sudarshana Kriya Yoga (SKY) in alcohol dependent individuals. J Affect Disord 94:249-253. Zautra AJ, Fasman R, Davis MC, Craig AD (2010) The effects of slow breathing on affective responses to pain stimuli: an experimental study. Pain 149:12-18.